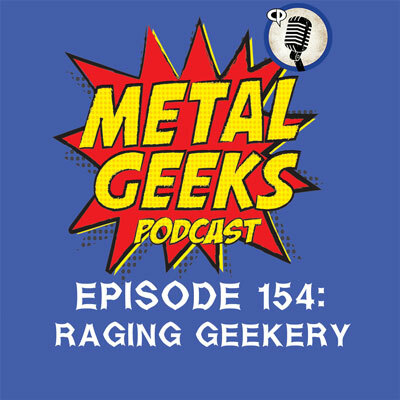 Metal Geeks 154: Raging Geekery | MSRcast and Metal Geeks Unite! Joining the Metal Geeks crew this week are Justin Corbett from Mindfudge Comedy Podcast and Thirsty from Raging Nerds Podcast as they rage geekery all over the place. Topics include Spider-Man PS4, Tell Tale games, Shadow of the Tomb Raider, changes to ticketing at Disney World, Call of Cthulu, Helloween, Kuma Burger, Mandy, Searching, The Predator, Behemoth tackled in George Hates Metal, and much more metal discussion! Keep it geeky! Check out our sponsor at tantrumcollectibles.com if you are looking for cool brands such as Funko, Bandai, Art FX, Banpresto, and more! Use the coupon code “metalgeeks” to save 10% off your entire order. Join us on our website at http://www.metalgeeks.net to keep up with all the geekery. Email us your opinions and ideas at msrcast@gmail.com. Follow us on twitter, @metalgeeks, and @msrcast. You can now find us on Instagram, @metalgeeks. Find us at Facebook/MetalGeeks. Subscribe to Metal Geeks Podcast on iTunes, and please leave a 5-star review on itunes and a like us whilst you are there. You can also find us on Stitcher as well as on Google Play. We are now also on Spotify, so jam us into your playlist! Don’t forget to pay a visit to all of our affiliates including ESOpodcast.com, and http://www.metalgeeks.net, your home for all of our Metal Geeks Shenanigans! You can now get some killer Metal Geeks merchandise over at redbubble.com/people/metalgeeks including tshirts and more! Catch you on the next episode, and Keep It Geeky!